We brought you the original, toughest shoe in training and have now added another option to the arsenal. The original F-lite 235, launched in 2014, was lauded as the most versatile training shoe, best shoe for the box, best workout shoe by Men’s Journal, Shape Magazine, and The Rx Review. Now, the v2 kicks the original’s a$s. 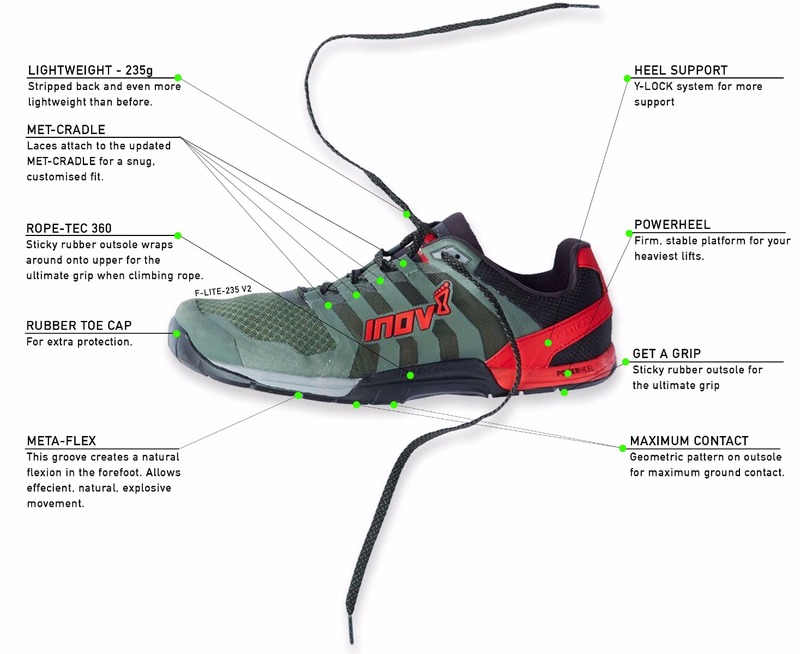 inov-8 was the first brand to make a shoe to withstand the box. To perform in the box. To be able to handle the unknown in the box. Now, we have perfected the art. Still the lightest. Still the most efficient and natural. With power and strength to withstand whatever you throw at them. The F-lite 235v2 is in an improvement to the already award winning original- the lightest, most stable, versatile shoe for the hardest workout you can put your body through. If you can handle it, the F-lite 235v2 can handle it. PATENTED GRIP: The sticky rubber outsole wraps around onto the upper- that’s the ROPE-TEC 360 technology. It gives you ultimate grip and confidence when climbing rope. GEOMETRY: The geometric pattern on the outsole is designed to cover the most surface area possible for maximum ground contact while cutting out non-key areas to reduce weight. META FLEX: The groove designed into the outsole of the shoe creates a natural flexion point at the forefoot. The design allows efficient, natural, explosive movement. MET-CRADLE: When you slip on the new F-lite 235v2, the updated Met-Cradle with the gusseted, soft, elastic, mesh liner will lock down your midfoot so the shoe will move with your every step. The laces attach to this system and adjust at each eyelet to provide a snug, customized fit. EXTRA KICK OF ENERGY: Our patented Dynamic Fascia Band technology is still built in to maintain it’s natural, efficient benefits. The anatomically designed technology mimics the windlass affect that the Fascia band provides and gives you an extra kick of energy with every step.